Heat oil in a large pot over medium heat. Add onion and saute until softened, 2 minutes. Add fennel and butternut squash. Saute 2 minutes. Add tomatoes, stock, bulgur, bay leaf, thyme, oregano and cheese. Bring to a boil, then reduce heat to a simmer. Simmer, covered, until vegetables and grains are tender, about 20 minutes. Add salt and pepper. Taste for seasoning. Stir in the kale and simmer briefly until brightened in color and wilted, 3 to 5 minutes. Ladle into bowls. Serve garnished with grated cheese. I just made a pot of split pea soup, happy dancing down in San Diego…Hello, fall! Ohh this looks good! Thanks for sharing! Butternut squash and Italian cheese are a marriage and this is a happy marriage soup in my opinion. How funny. I just finished shooting a vegetable soup with butternut squash and white beans that I made this morning. It’s definitely the season for this kind of soup. Beautiful photo!! Now THAT is a bowl full of nutritious, delicious color! The addition of fennel is inspired! 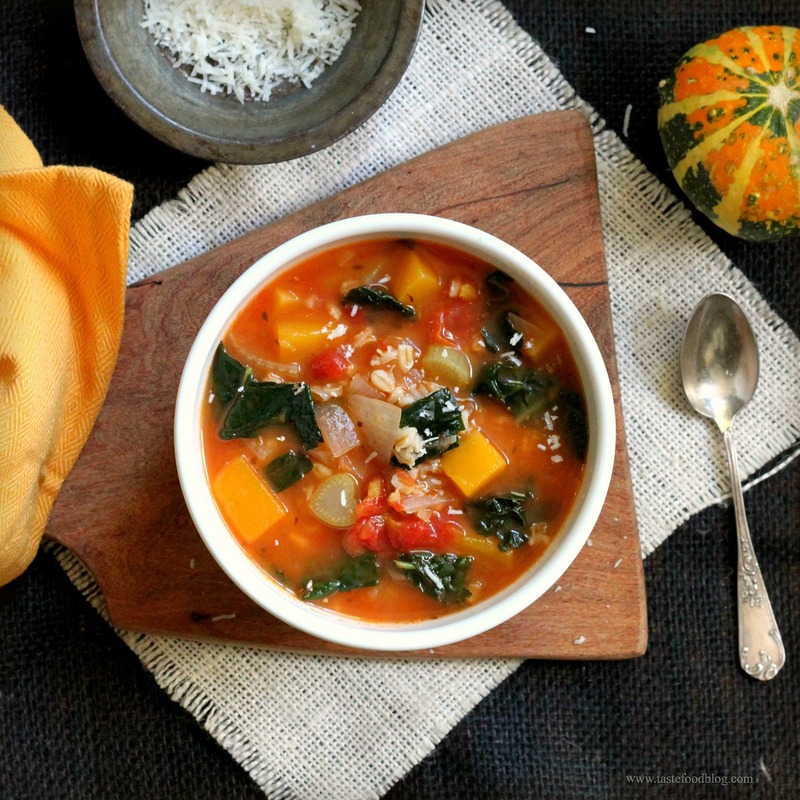 What a luscious soup for the early days of autumn! hahaha, I’m happy it’s here as well. But I’ll miss warm days so much. This looks great! I’m going to make it tonight. When do you add the rind? I accidentally bought turnips instead of fennel. Would that be an ok substitution? And no bulgar or farro. How about ww quinoa ? Thanks for any help/ suggestions. You can’t go wrong with turnips, but you’ll miss the anise notes of the fennel. Quinoa is always good, but you’ll find it to be less tender than farro. Barley is another good substitute. I made this tonight for dinner tonight. I did use fennel but substituted quinoa for the bulgur and sautéed some sausage and garlic at the start to add some protein. It was DELICIOUS!!! And I almost never leave comments. Make his soup. You won’t regret it. Thank you for sharing!